It's been a while again since my last developer blog and I definitively think about doing this more often. First of all the Halloween events are still in progress and I've seen A LOT of players that love the event and I am very happy it turned out this way. This is definitely we plan on continuing so expect even more, better and bigger events for Christmas and further on! Now, I don't want to make this any longer than needed so let's jump straight into it: the tree rework. 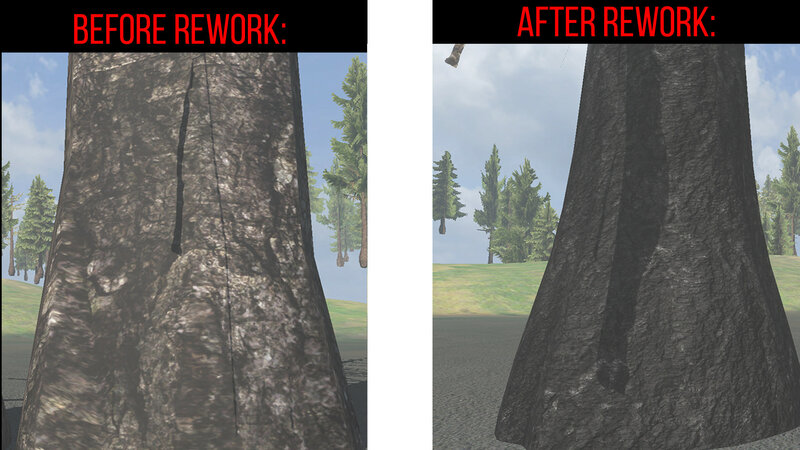 Because as of this moment the trees in our game look like complete garbage, they are unoptimized, causing issues and we want to step up with the overall look of New Z.
Optimize / fix them. (Lower poly count and fix some other technical issues) - So that they no longer cause potential issues. Fix the model so that they don't longer look like "block trees". Fix the LODs, improve the LODs. Fix the "stuttering issue". (when looking at the trees and walking backwards) when the tree switches LODs there is a "stutter" that doesn't feel / look natural. Trees are just a start. We plan on improving the rocks, terrain textures, other nature, buildings and more in the near future with the overall aim to bring New Z to the next level. Please understand that these changes have minimal impact on player's performance. We wouldn't do this if it would negatively affect players performance and therefor we are also doing a lot of testing before any of this gets released. Also to fix and optimized all the tree LODs. A lot of them have missing LODs and LODs with incorrect pivot points. This results in players (when looking at the trees and walking backwards) when the tree switches LODs there is a "stutter" that doesn't feel / look natural. 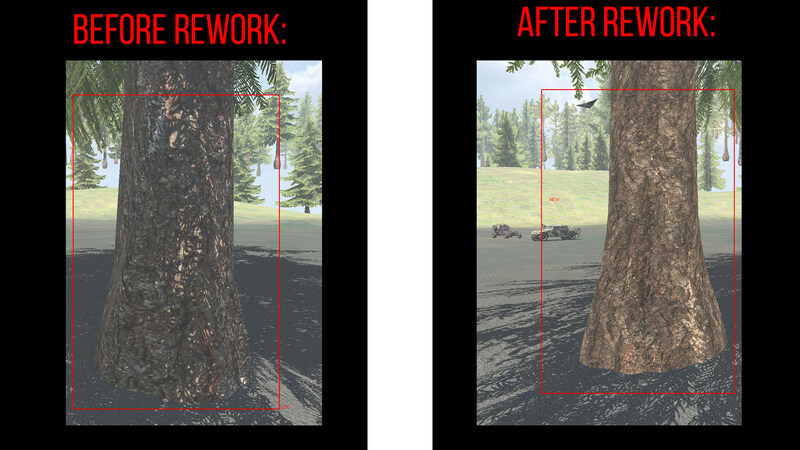 After this rework the trees look VERY much better, they are fixed, improved and optimized so it's basically a win-win situation. This rework contributes in our overall goal to give New Z a real refreshing own "New Z" look where we start with the most common / obvious and noticeable things, in this case the trees. This is just for the current pine tree models. 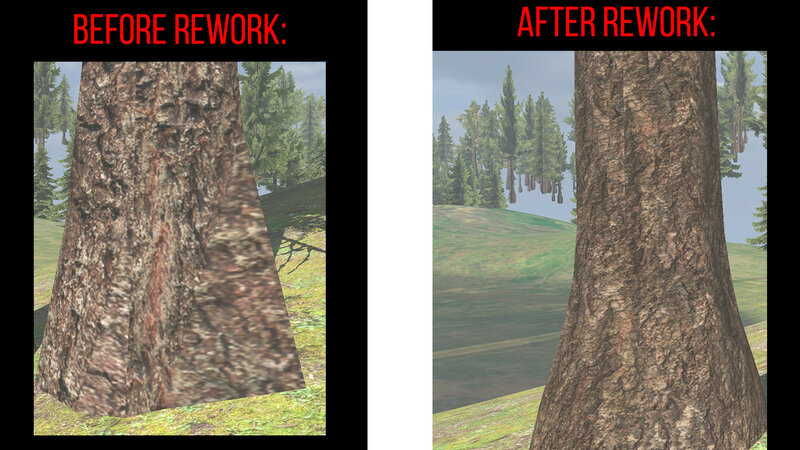 We have 4-5 other types of trees in the game where the same improvements have to be made. I used the pine trees as an example as these are the most common in all our maps. 10/10 for the rework of trees, that looks absolutely amazing! 10/10 for the rework of trees, LOOK IS RLY GOOD. GOOD JOB SIR. ! Great job as always Sven! I aim / see this as a start to bring New Z to the next level. Going to finish the pine trees collection and then jump to the other collections. - Upper terrain tile / texture resolutions. This is still something that's on a very low resolution by the engine. - Rework the rocks. Fix them, improve them, optimize them in the same process as the trees. - Rework building textures. Upper quality, higher resolutions, optimize them, new lods etc. The tree optimization looks AWESOME!!! Good Job @Sven. To all the devs, keep up the great work. I've never really cared about the textures of the tree but I do like it, if it improves the performance of the client. Thanks for the feedback! 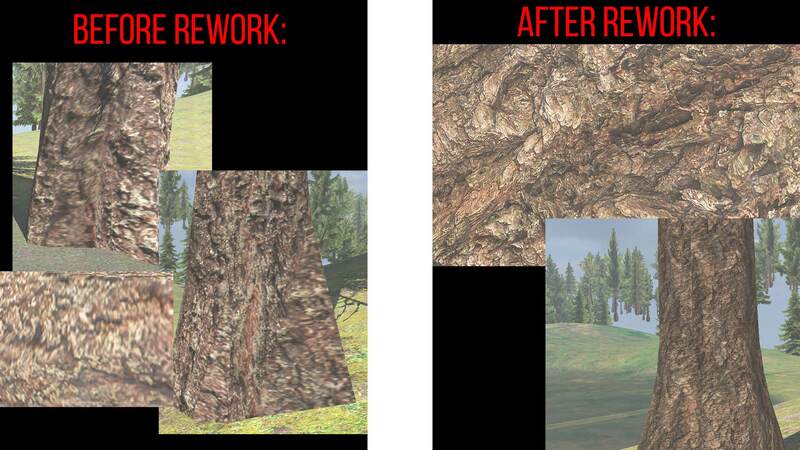 It's great that it's not JUST optimizations but a lot of reasons to rework / fix the trees. Also plan on adding more in the future but first I wanted to fix and rework the current trees to a state that I am happy with it myself. Previous they literally looked like *ss. As for the rocks thanks for the points. I have to say if with a rework there I would look more at the individual models and not really where they are placed. This is more a job from Steve's side. It's funny cause I never really realist it either, but the ones still currently live in the game don't only look like sh*t but are also unoptimized, missing lods, bad quality, bad quality of lods, model mistakes, possibly causing errors / crashes and even more stuff. Enough reason to rework them and fix everything at once! If you go in game now, after reading this, you'll probably have a "re-look" at the current trees and actually realize how bad they look. Funny. I bet you can't take your eyes from it anymore now. Sorry!! Exactly. Especially as we of course also want to literally "step up our game". (very literally actually haha) Anyways, improvements in textures can't harm much. As of right now it would mostly affect GPU performance but these days people have averagely more than better GPU's. What does this actually mean for the performance of the game? Would you please pass this on to @Steve Ecke? The placement, as well as the texture, needs to be fixed. Well. Nothing will really change pretty much while at the same time the trees will look 10 times better. Possibly a little better performance. 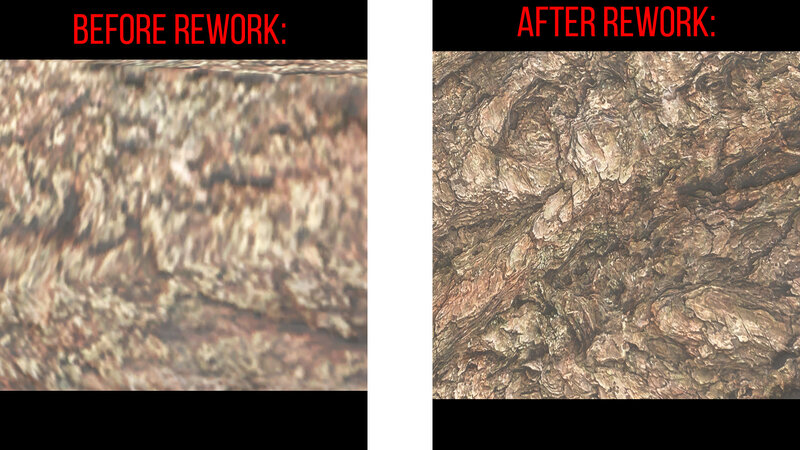 Tree textures will look better and higher quality. No longer "die-ing behind trees", or getting shot from a player behind a tree where you can't see that player. 10x better look of the game. 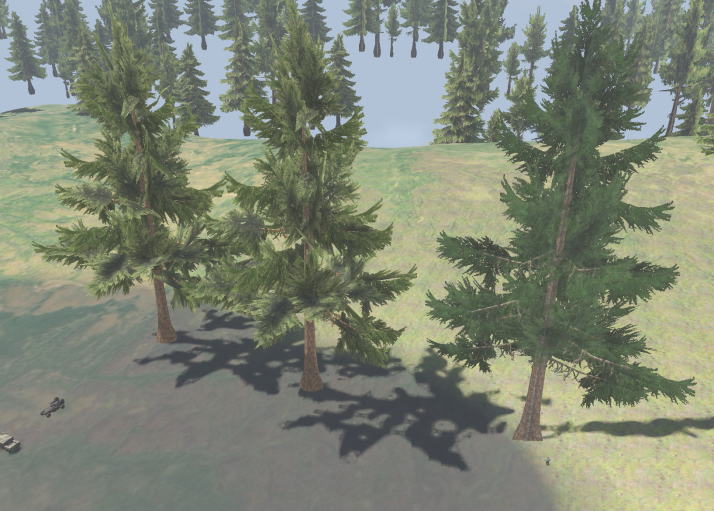 Improved the LOD switches: no more "stuttering" when moving and looking at the trees. These are placed, as the roads ends here, to make it look more realistic and to avoid the road randomly having a straight cut line in the landscape. True but this is mostly for optimizations reason. I am working on improving these looks while keeping the same (or even better) performance. I believe you can sir. I trust your job.